We have started on a fantastic project at The Figaro Shop that we just had to share with you. We are in the process of creating an extremely special car for a customer in Canada. She has extremely low mileage to start with but by the time we have finished with her she will truly be one of a kind. 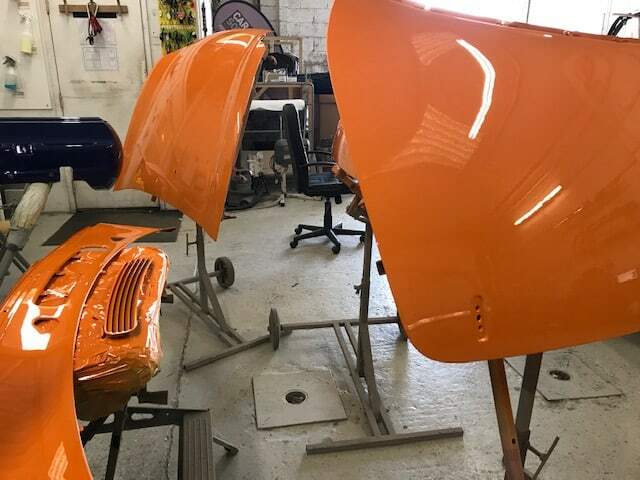 She is going to be turning Audi TTS Solar Orange – and, as you can see from some of the photos, with help from our friends at Farecla finishing products we have already started on the transformation of her bodywork to make her truly gleam. But the fun doesn’t stop there! She is going to have a matching orange leather dash top, orange piping to her seats and orange seat belts. We are also giving the inside of the glove box a bespoke orange leather finish. She will have a state of the art Bluetooth stereo and speakers, and leather sun visors with mirrors in orange with an ivory stitch to fully enhance the two tone effect. Even her headrests will get the custom treatment – with orange piping and a bespoke design as requested by the customer stitched into them in orange. Every element of this fantastic little car is being overhauled to make her truly remarkable. We are loving working on her and will keep you posted with some more pictures as the project nears completion.